Radio tracking shows one of the Kimberley's iconic frogs could be picking up a deadly lungworm from cane toads (Rhinella marina). 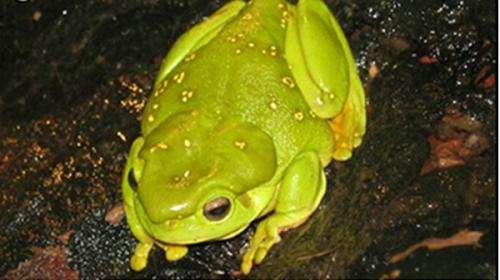 Researchers found magnificent green tree frogs (Litoria splendida) have limited opportunities to interact with the toads. However a third species, the common green tree frog (Litoria caerulea) could be an unwitting accomplice, transferring the parasite from the toad to its fellow frog. The common green tree frog tolerates lungworm infection better than either of the other two. After University of Sydney post-doctoral fellow Lígia Pizzatto discovered the lung worm (Rhabdias seudosphaerocephala) kills magnificent green tree frogs, she led another study to see how vulnerable they were. Her supervisor, herpetologist Rick Shine, says Rhabdias is a nematode worm. "The adults live in the lungs of the toad, they produce eggs and they're sort of coughed up into the digestive tract of the toad and then passed out," he says. "When the toad goes to the toilet the infective larvae of the lung worm come out." They then go through another stage of the life cycle and they become infective and start looking for new hosts. "If they encounter one they basically burrow through the skin or they crawl across the top of the eyes into the body of the frog or the toad," he says. "Then they burrow their way through the body to find the lungs." He says the species' preferred daytime habitats are very different. Magnificent tree frogs favour places such as trees and rocky outcrops, inaccessible to the ground-dwelling toads. However disturbed ground provides opportunities for them to interact when they hunt at night. The common green tree frog, which spends more time on the ground, could be the carrier. Prof Shine says the researchers came to these conclusions after radio tracking the three species at Lake Argyle and Kununurra in the Kimberley during the 2010–11 wet season. 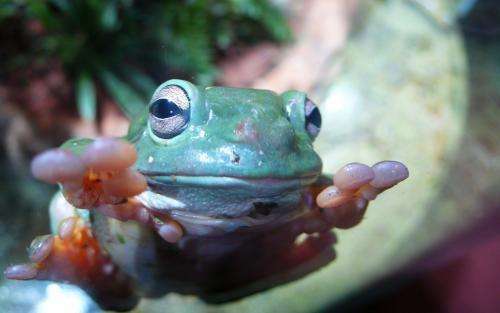 He says Dr Pizzatto and PhD candidate Camilla Both attached devices to the amphibians' hips using stainless steel chain. They tracked 23 toads, nine green tree frogs, and 16 magnificent green tree frogs at the WA site; and a further 12 toads and 13 green tree frogs in the Northern Territory. This allowed them to locate how far the amphibians were moving and their day and night-time habitats. He says L. splendida can probably survive the onset of cane toad-borne lungworm, as they mostly inhabit more remote country whereas cane toads favour disturbed ground such as townsites and roads. Probing Question: What's the difference between frogs and toads?